Guest post from St. Pierre Marriott Hotel & Country Club golf professional, Craig Dun. It’s not uncommon for fitness fanatics to dismiss golf as a non-physically demanding sport, but in actuality, the advantages of golfing are plentiful. We explore the ways in which this game benefits the body, and how you can get the most from it when you’re out on the course. The grip is one of the primary fundamentals a golfer is taught. In fact, the first step in learning the swing is learning how to hold the club. Without the proper grip, making consistent golf shots is much more difficult. Many golfers don’t understand how important the grip is, and they continue to use a defective grip because they have always done it that way and it feels comfortable. A sound grip enables the hands to work together to build swing speed and deliver the club head to the ball at a square angle, resulting in accurate shots. With your left hand open, start from the base of your little finger and place the club diagonally across to the middle of your index finger – the most pressure should be supplied by the left hand’s last three fingers. Interlock together the left index finger and right little finger so that both Vs formed between your thumb and index finger will point towards your right shoulder. Once we get the proper grip, the next important part of the golf swing is achieving the correct posture. The one common denominator you see among all good players is their posture. It’s important because it determines the shape of your swing, and allows you to make the proper turn back and through the golf ball. Stand tall with the golf club out at waist height, parallel to the ground. Tilt from the hips keeping your spine straight until the club touches the ground. You should feel a pelvic tilt (bum out) with a flat back as you bend over. Slightly flex the knees with your weight on the balls of your feet. Your arms should hang straight down from your body and you should then grip the club from there. If you have a problem or restriction within the body that you have to compensate for elsewhere, this can cause pain in certain areas, resulting in poor performance and insufficient movements – meaning power will be lost. There is a greater amount of risk when flexibility is poor, but reaching your optimal level of flexibility makes it easier to maintain a better posture and axis of rotation, plus it keeps the club on the proper path for square contact. Do not overstretch. You should feel a good comfortable stretch in the targeted muscle group but you should not feel pain. No bouncing. Go to the farthest point that you can without pain and hold the stretch for 15-30 seconds. While stretching, make sure you breathe at all times. Do not hold your breath. Exercise: Golfing is often thought of as a passive sport that does not require any real degree of fitness. In reality, golf incorporates cardiovascular exercise, strength training, and even balance and coordination. 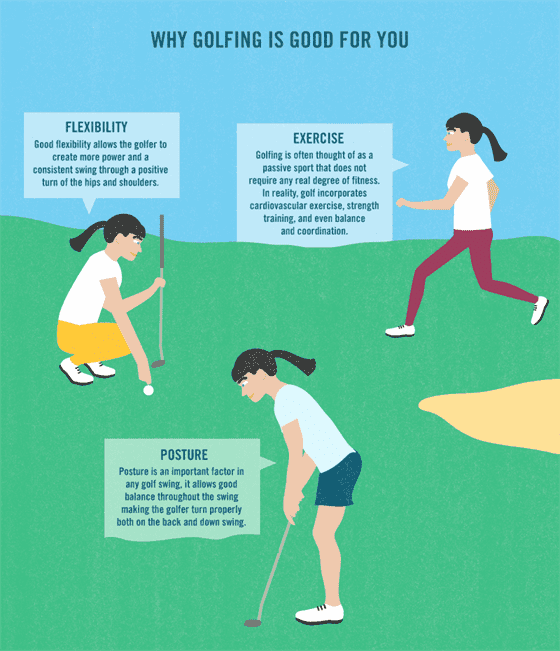 With all of these benefits, it’s hard to say no to a game of golf. Flexibility: Good flexibility allows the golfer to create more power and a consistent swing through a positive turn of the hips and shoulders. Posture: Posture is an important factor in any golf swing, it allows good balance throughout the swing making the golfer turn properly both on the back and down swing. Craig Dun is the resident golf professional at St. Pierre Marriott Hotel & Country Club in South Wales. Glad the article was helpful for you.